In 2015, brewers of Kazakhstan cut the production by 3% to 47.7 mln dal of beer. The dynamics of beer production was very uneven throughout the year. The second quarter of 2015 was a disaster for all Kazakh brewers. And in the fourth quarter, in November and December, the production grew unexpectedly. Such fluctuations are difficult to explain with market reasons. That is why we tried to analyze even the impact factors that run beyond the frames of the official statistics. In order to estimate the weather impact we generalized the archival data on temperature and precipitations in two cities in the south and north of the country, namely, in Almaty and Pavlodar. 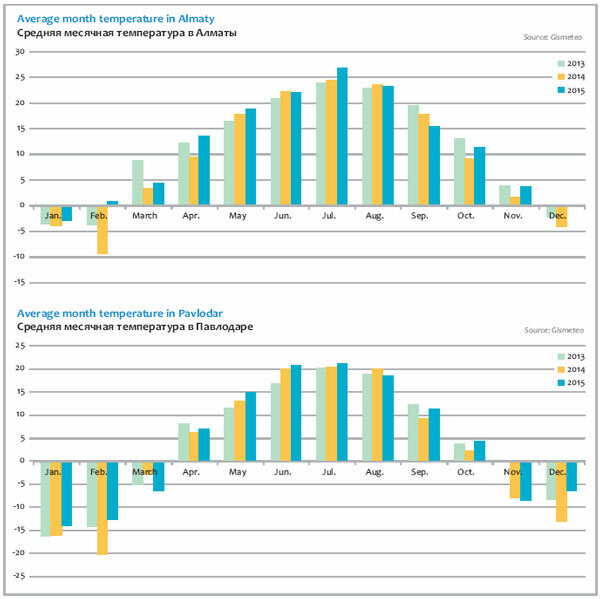 The temperature in 2015 was in general favorable for brewers’ sales. Thus, exactly the period of reduction of beer output, from April till June 2015, turned out to be warmer than the previous year. In September, it was comparatively warm in the north and cool in the south. Though it was the end of the sales season. The end of the autumn in Kazakhstan was comparatively warm, but did not seem to influence the market either. Rains in spring could have a negative effect on the sales of brewers in the north of the country. It was relatively rainy in August in the south. In general, we can say that the weather was rather a positive factor in 2015 and probably had a slight balancing impact in the dynamics of the beer production decline. The beer markets reduction in Eastern Europe was much driven by economic downfall. Was this reason the decisive one in Kazakhstan too? If we base on the official data, the season of 2015 was marked by positive dynamics of the population actual incomes. In March, when there was a onetime income decline, the rates of beer output were also lower. However, the subsequent rapid recovery of the population income growth did not bring about changes of beer production rates, on the contrary, they continued nose-diving. That is why, in the first half of 2015, one could rather speak of negative expectations due to the general situation in the region market than of substantial drop in the living standards of Kazakhstanis, which could impact the beer market. Retail price is an important factor effecting consumption. If we consider the beer market in general, till September 2015, the average beer price was not growing rapidly. In general the dynamics was even negative in the period of the fast production decline. Inflation which could have impacted the consumption structure in case of high rates was also rather low till September 2015. The subsequent leap of both beer prices and consumer goods could not influence the market strongly due to its seasonality. Even more so as the beer production also started growing despite the prices growth. The fourth factor, which is possible to measure basing on the official data, is the structure of drinks shipments. Beer rivals are strong and refreshing drinks. Thus, everybody knows the effect of mutual substitution in the pair “beer-vodka”. However vodka deliveries in 2015 fell by …%, which is much more than beer fell. Besides, there was a delivery reduction of mineral and drinking water (…%) and soft drinks (…%). Official data do not reflect growth of the import supplies either. According to them … mln beer liters was imported in 2015, which is …% less than in 2014. That is, the import was falling along with production. And export supplies fell substantially too – by …% to … mln liters. Yet, such a minor volume could not influence the trade balance. The negative production dynamics in the second quarter of 2015 can be fully explained by rapid volume growth of unofficial import of beer from Russia. From June 2014 to January 2015, due to the ruble devaluation, its rate against Kazakh tenge halved from 5.45 to 2.67 tenge for a ruble. Then ruble started winning its positions back but the bounce in the pair tenge/ruble was low and fluctuating. For Kazakh beer market the ruble devaluation meant prices downslide for Russian brands. The government strived to timely deal with the most sensitive import items. In keeping with the best traditions of the modern Realpolitik because of “nonconformance to the food safety standards” a ban on import of major premium Russian brands, namely, Miller Genuine Draft, Hoegaarden White, Grolsch Premium Lager, Brahma, Pilsner Urquell, Zhiguli Barnoe, and Zhiguli Originalnoe was imposed in November. As we can see, by half this ban impacted brands by company AB InBev, that does not have production in Kazakhstan. But the limitations were in force for several days only as after consultations, Russian importers got permission to eliminate the nonconformance till 1 January. In our opinion, it became apparent for authorities that in the conditions of transparent borders of Customs Union any prohibitions would be ineffective. Such steps did nothing but stimulated unofficial import that flooded the market. The authorities of Russia and Kazakhstan admitted that statistics did not account small-scale volumes brought in by individuals. 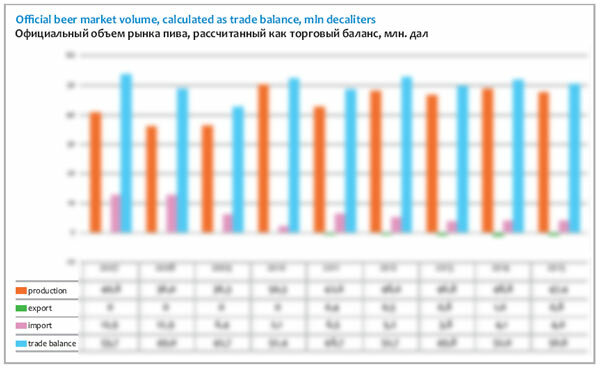 In their words, main additional import volumes from Russia are involved in non-observed trade and are unaccountable. It is not possible to measure the scope of such trade, but the substitution of Kazakh beer by import was obvious, if we base on the difference in volumes of Kazakh brewers’ production in 2014/2015. 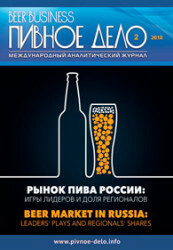 Approximately 30 mln beer liters could get to the market which is not so much in Russian scale. At the same time, unofficial import gave a good shake to Kazakhstan market. According to the press in February 2015 Russian beer at wholesale prices could be bought cheaper than mineral water. A representative of one of Kazakhstan companies told that after landslide of prices, a bottle of Russian Zhigulevskoe could be bought for 83 tenge. Beer Klinskoe cost 113 tenge for a bottle which is cheaper than Karagandinskoe. Retail prices were decreasing with a small lag against wholesale and the fastest decline was observed in March-April. In total from January till July 2015, a liter of Russian beer in retail got cheaper by … tenge (or …%) to approximately … tenge. By July, the average prices of Russian and Kazakh brands were on a par and in certain regions and for certain brands beer prices were close to damping. That caused confusion in the price segmentation of the market. In summer, the government of Kazakhstan did not cope with the pressure of the falling prices and surge of cheapening import. In August, they let tenge float freely and the national currency devaluated rapidly. While in mid-2015, the official rate ran at 150 tenge a dollar, by the beginning of 2016, it was 350 tenge for a dollar. The devaluation resulted in partial restoration of the market segmentation by price. Though the gap between the average prices for Kazakh and Russian beer has become considerably shorter than early in 2015. The price competition made it for a long time impossible to raise sale prices for Kazakh brewers’ production even despite the devaluation. According to the official data, the average producer’s price in January was … tenge for a liter and … tenge in November. And the average selling price for beer by transnational companies was approx. … tenge/liter for a long time. Companies with national capital had very uneven dynamics – in spring, the beer producers’ price was on the average … tenge/liter. The further dynamics is difficult to reveal. One way or another, companies with national capital, that focus on the economy segment incurred less losses than international groups judging by the production dynamics. Even despite the fact that except for Shymkentpivo, all major regional breweries are located on Kazakhstan border, where the diffusion of Russian beer is most intensive. On the one hand, prices of “regionals” remained low enough to stand in price competition. On the other hand, at least half of their products is sold in kegs through a special trade channel – a network of draft beer shops. Rise of sale and retail prices after tenge devaluation was rather moderate against the inflation acceleration. That is, in the second half of 2015, the main burden of the economy recession lay on brewers. If we base on the average sales prices, brewers’ revenue from beer trade ran at … bln tenge by the end of 2015. As the average weighted sales price remained practically the same, and the natural volumes of the production fell, the revenues even decreased by …% against 2014. At the same time, if we transfer brewers’ revenues in dollars, the decrease will be …% to $… mln because of tenge devaluation. Average weighted retail prices for beer in Kazakhstan saw some growth in 2015, approximately from … to … tenge/liter. Accordingly, the official beer market decreased approximately by …% to … bln tenge. 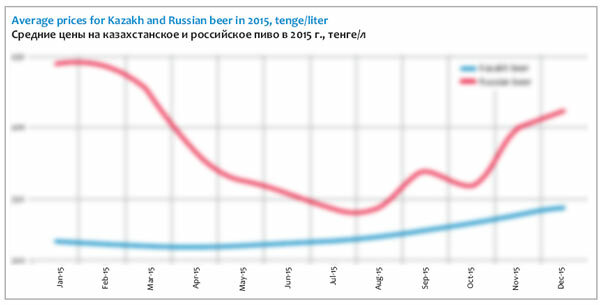 In dollars the beer market shrank by …% to $… mln due to tenge devaluation. The real beer market size in monetary terms is difficult to measure because of sharply increased unofficial import volumes. If we rely on speculatively calculated … mln liters, then according to official data we should also add about … bln tenge or $… mln to the market size. Since both ruble and tenge are currently floating freely, we can say there are no conditions now for supplying big unofficial import volumes from Russia that we observed in 2015. Thus one can expect the effect of low base which will lead to a small growth of production in the first half of 2016. The old excise rate at the level of 26 tenge/liter will also contribute to it. Weather will have mostly neutral influence. However worsening of economic situation in the region, which continued because of oil price decrease, does not give any hope for growth in 2016. 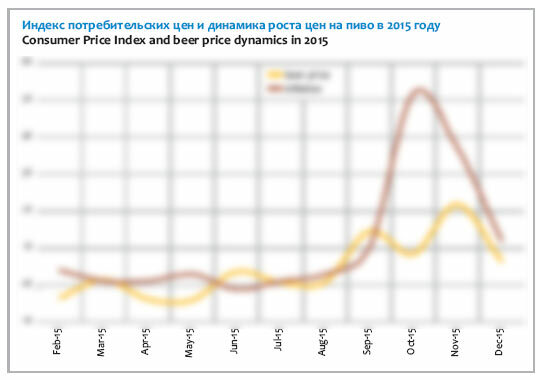 The price segmentation of the beer market in Kazakhstan was strongly influenced by several events and trends of 2015. The mainstream segment faced pressure from sales growth of draft beer in kegs by independent regional producers, with retail price belonging usually to the economy segment. The growth in supplies of temporary discounted Russian beer also harmed the mainstream segment of the beer market. Devaluation, recession and negative expectations led to market share reduction of the superpremium beer and import from EU countries. The competition between producers and mutual attacks impacted their market shares, which in its turn influenced the price segmentation. The nostalgic trend, in particular, increasing loyalty to Zhigulevskoe, preserved during the season 2015. Zhigulevskoe by two market leaders belongs to the mainstream segment, yet the share of other producers with more affordable versions of Zhigulevskoe was growing faster. 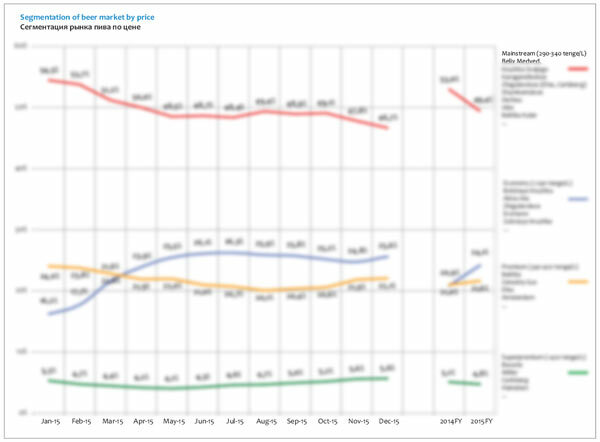 Sales were most intensively reallocating by price segments during the period from January till May 2015. Then the mainstream segment lost … p.p. At the same time, the economy segment grew by nearly 9 p.p. On the one hand, the economy beer share in Kazakhstan usually grows in summer, when regional brewers are actively working. But in 2015 their output increase was unexpectedly big (Firma Arasan in the first place). And after the close of the high season, the regional’s share did not go down. In autumn 2015, as the devaluation shock was not so acute, there again arose a trend for beer market polarization. The share of marginal and economy brands was enlarged at the expense of the mainstream share reduction. As a result, by the end of 2015, we can speak of a considerable decline of the mainstream segment where Efes and Shymkentpivo were the main victims, while the share of Oasis and regional companies experienced some growth. There was a minor share of the superpremium segment, where mostly Efes incurred losses. At the same time premium beer has somewhat gained weight and here the biggest beneficiary was Carlsberg. 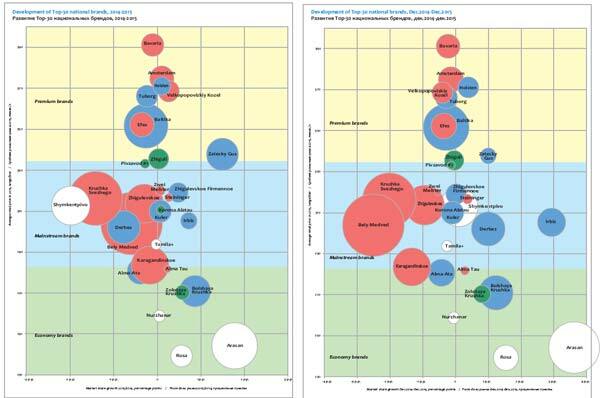 In the economy segment the many brands by regional companies as well as by Oasis and Carlsberg saw their share grow. According to a report by Carlsberg Group, the on-trade segment share in the total sales volume of beer in Kazakhstan runs at …%. This segment, by definition, is represented by HoReCa establishments selling beer from kegs. But special beer shops or beer departments in supermarkets are equally important trade channels. Regional producers sell about …% of their production. If we sum up the sales of draft beer in HoReCa and specialized shops, the draft beer accounts for nearly a quarter of the market. Accordingly, packed beer accounts for approximately …% of sales. Kazakh producers of draft beer in 2014 estimated nearly 34 000 outlets selling draft beer in PET. In the northern regions of Kazakhstan their specific number (calculated basing on the number) is higher than the country’s average. For example, in Pavlodar alone according to National Chamber of Entrepreneurs Atameken there are 700 retail outlets dispensing beer in kegs. In Kostanay region according to producers 800 such outlets are located. It is unlikely that fixed installations working the year round are meant here, however the figures are impressive anyway. Given the PET ban, the main competitors on the market of packed beer are bottle and can. It is rather natural that the can popularity in such conditions is growing rapidly. According to market players its share in the sales of packed beer in 2015 increased by … p.p. and reached …%. Consumers are giving ever greater love to one liter pack – both can and glass bottle. Its share by the end of 2015 attained more than …% on the packed beer market. Year 2015 gave a lot of challenges to the mass beer. Most of old and big brands saw their market share decline. We should say that in this respect Kazakhstan is not unique. Lower consumers’ interest to old local brands by transnational companies can be observed on the neighboring markets, in Russia and Ukraine. This process can be called a global trend. The traditional marketing of mass local brands development has become poorly performing as a tool to work out brand loyalty, however, it is still effective enough for attacking similar competitors. Beer lovers willingly switch to alternative offers if they find them more value-for-money, “fair”, “genuine”, and “fresh” (in all senses). A big impact into the preference change was given by commodity goods hike which made Kazakhstanis more rational and thrifty and prompted them to pay attention to economy beer market segment where regional producers are well presented. Buying inexpensive and fresh local beer from kegs at specialized retail and HoReCa became an alternative to the mass beer. 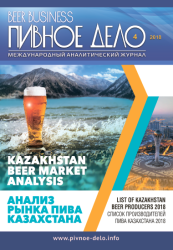 As a result, in Kazakhstan there is a fall of sales of market share of the company owning the “controlling stake” at the beer market – Efes Kazakhstan. At the same time, the closest national competitors’ shares are growing. They are Carlsberg Kazakhstan, willing to return the lost positions by launching specialties and renewed brewery Perviy Pivzavod (Oasis CIS). The growth of production, sales and market share of Efes Kazakhstan was continuing for a long time and stopped only at the end of 2015. Under our rough estimation, the volumes of Efes output dropped by approx. …% to … mln dal. The international brewing business is presently having harsh times. Significant downturn of Russian market and a Ukrainian brewery stoppage as it was located on the territory of the conflict, led to a …% nosedive of EBI volumes to … mln hl. This means that the weight of Kazakhstan in the international business, despite the poor performance has increased and equals nearly …%. However, unlike other problem regions, the decline here can be explained with fiercer competition. Efes extended too widely on the shelves and market in general, so brand development and attacks of other ambitious players are one way or another targeted at Efes. For the recent ten years, the company has been consistently pressing its main competitor, Carlsberg Group, and achieved much success. While in 2008, Efes had a …% share of packed beer and Carlsberg – had …%, by 2010 the companies’ positions equaled. By 2014 Efes share achieved its historical maximum – …%. The company development took place mostly due to rapid growth of two brands taken from Russia, that is, Beliy Medved and Kruzhka Svezhego, which became the leading brands in the company’s portfolio as early as four years ago. Their reinforcement was until recently based on launching many sorts and innovative package. Thanks to its leading position, the company was able to occupy much space on the shelves and propose a wide product range. As a result two brands started forming a half of all Efes sales and nearly a third part of the packed market. Marginal brands that joined Efes due to business merge with SABMiller also gave an impetus to the company’s sales, which still has its positive effect. However, today we can already speak about inflation of such vague beer images as “barrel”, “mild”, “special” and so on. For example, sorts … or … have won consumers’ interest for a long time having taken a part of market share from the major sort … . Yet, the interest to “special” mass sorts turned out to be unsteady and the reverse process caused market share reduction of the brand. Brand … also managed to draw many beer lovers’ attention by launching “mild” sort. But at the same time they obviously ignored the major sort. Apparently, such blurring of brand image and fiercer competition led to its considerable market share decline. Certainly, we cannot forget that Beliy Medved and Kruzhka Svezhego were victims of economy recession. Their share decreased under the pressure of dropped prices for Russian import, currently attractive economy sorts by regional producers and reinforced Zhigulevskoe. Development of specialized retail selling beer from kegs was met by Efes with a tried and true step as it output “draft beer in a bottle” with corresponding volume and package design in March 2015. According to the company statement: Brand V Rozliv by Beliy Medved is draft beer with a rich taste packed in bottle and can of 1 liter. V Rozliv is a splendid alternative of draft beer sold in plastic bottles of 1.5 liters. This means that genuine draft beer is now available to consumers at any place. It is difficult to say whether the specialty took market share from regional beer or from other sorts of Beliy Medved, but by the end of 2015 at least …% of the market accrued to it. Other company’s brands proved to be steadier. For instance, one of the oldest brands, beer …, as well as … version by Efes have lost only a small part of its market share, having kept it at the level of …-…%. On the one hand, even minor share reduction of … by Efes went against the general context of the nostalgic beer popularity, however, its retail price was considerably higher than that of competitors. And on the contrary, … stability could have benefited from the comparatively available price which corresponds to the border between mainstream and economy. Besides, the popularity of these brands was buoyed by dispensing in one liter bottle. In tune with the tendency of market polarization, there was a share growth of two small and new brands by the company – premium “Austrian” beer Zwei Meister and specialty of 2015, inexpensive beer Alma Tau. This launch looks like an attack on one of the oldest brands by Carlsberg - Beer Alma-Ata which is also positioned in the economy segment. Apparently, the attack was successful as Alma-Ata share has reduced a little after the competitor’s launch, in spite of the general sales rise of inexpensive beer. At the same time we cannot speak of reinforcement of company’s positions as in 2014 brand Lyubitelskoe was excluded from the product range. The retail price of this brand was at the level with regional producers’ beer. In 2013, due to the launch of Lyubitelskoe in can, it accrued to nearly …% of the market. But then the competitive situation became fiercer owing to appearance of Demokratichnoe by Carlsberg at democratic damping price and to sales growth of Zhigulevskoe and brands by regional companies. The company’s positions in the premium segment were more stable, though different brands developed differently. We can say that certain worsening of the title brand positions, beer Efes was set off with adequate improvement of Velkopopovicky Kozel positions. However, Czech brand was attacked by a competitor and failed to consolidate the positive dynamics. The biggest negative impact in the sales dynamics of Efes was made by Almaty market, where the competition has become much more intense. Although the company dominates at the national level, in 2015, here the market shares of Efes and Carlsberg came to one level. Considerable pressure on Efes in the southern capital is also exerted by Perviy Pivzavod (the first brewery), CBH and a lot of other producers. If we take a broader look we will see that the positions deterioration took place in many key regions and was caused by Carlsberg activity that took over different market segments from Efes in different regions. Carlsberg Kazakhstan was the leading beer producer in Kazakhstan until 2010. The company won its first place due to strategy of developing license Russian and West-European brands. Company Efes was generally acting in the same manner but faster as the decisions on launching or vice versa excluding a brand were taken more often and globally. For instance over the recent five years, the leading three of Efes have been totally changed, while at Carlsberg the main role is still played by Baltika and Derbes. Yet, at the moment, it looks not so much clear-cut, it might be that there has been a turning moment in the competition of the two transnational companies. In 2015, the market share and output volumes of Carlsberg rose considerably. According to the company report the sales increased by …% by the year end, which is excellent given the falling market. Rapid growth started as early as in March and continued till the yearend or further. Under our rough estimation, by the yearend, the company’s output volumes came up to … mln dal. of beer. Sales volumes of Carlsberg on Kazakhstan market are very small against the group as a whole. Even in the general volume of region Easter Europe where Kazakhstan is attributed, its share under our calculation amounts to …%. However this is one of few markets where the company managed to achieve which looks especially impressive against the failures in Russia and China. The present growth strategy of Carlsberg on Kazakhstan market can in our opinion be called “surrounding” of mainstream segment borders. The sales were boosted by three brands, two expats from Russia – Zatecky Gus and Bolshaya Kruzhka, that appeared in 2011, as well as Kazakh brand Irbis, that found a new lease of life after two year break when it was excluded from the product line. It is well-known that due to its license brands Carlsberg has been exceeding and still exceeds Efes on the premium beer market. Baltika has long become the major brand in this segment and nothing seems to threaten its market share of …%. Yet, despite constant launches under the brand umbrella, it seems to have hit its potential and its share risks of declining, although it grows in certain regions of Kazakhstan. Youth beer Tuborg is in the similar position, the average price of which is little more than that of Baltika. However the company managed to improve its position in the premium segment by Zatecky Gus. In Russia the company ventured launching the mass brand beyond Baltika umbrella as long ago as in 2009. Then Zatecky Gus considerably lowered the price level in the segment of Czech beer and even in 2015 did not exhaust the potential of the market share growth. In Kazakhstan Zatecky Gus was launched at the national level early in 2011 after successful “piloting” in Russia and was growing rapidly, having won …% of the market by the end of 2015. Zatecky Gus is developing in comparatively vacant niche at the border of the mainstream and premium segments, keeping price distance with license brands and being very similar to them by external features. We should note that license Czech brand Velkopopovicky Kozel, that entered Kazakhstan market later, found it difficult to compete with such market player. It would be correct to say that Zatecky Gus is taking consumers from it. While the price of Zatecky Gus is slightly lower than most of mainstream brands, “from the bottom” the medium price segment is pressed by Bolshaya Kruzhka. This light beer is dispensed in non-standard pack of 0.64 l with a special design. It is noteworthy that launching of Bolshaya Kruzhka can also be considered an attack on the competitor, namely, Kruzhka Svezhego by Efes. At least Efes was at law with Carlsberg, asking traders, though without result, to refrain from selling Bolshaya Kruzhka. Launching of sort “mild” in 2013 also looked like a rather straightforward attack as company Efes had long ago included it in their portfolio. Carlsberg’s offer looks more worth for money, yet consumers categorize the brand as mainstream, not “cheap beer”. In all accounts, in 2015 the market share growth of beer Bolshaya Kruzhka was accompanied by the share drop of Kruzhka Svezhego. Finally, a good contribution to the market share growth of Carlsberg was made by relaunching of medium price Irbis. This is one of the oldest national brands released in 1998 and the first brand in the portfolio of company Irbis which was later taken over by the international group At that time the company’s portfolio got Derbes brand. The two brands were located on different floors – Derbes remained mainstream and Irbis became premium. However, since 2010, the strategy of filling premium space with Russian license brands has led to Irbis popularity loss. The release of brands Gold and Ice has not given results either. Probably consumers did not understand why they should pay extra for beer produced locally, though it might be “a special brand for special people”. However, the same strategy led to market share decline of medium price beer Derbes, which also started experiencing pressure from Beliy Medved. As a result, brand Baltika rapidly ousted Derbes from the flagship position in the company’s sales, and in 2015 Derbes had to yield its second place to Zatecky Gus. Thus, Carlsberg Group, on the ground of success in the premium segment, found itself poorly presented in the mainstream segment of the market. According the company data, after the launch of renewed Irbis, over the first six month of active sales, the brand has won a …% share of the market by December 2015. Such result can be in general considered adequate, given the former popularity of the brand, developed distribution system and relatively inexpensive brand price which approximately equals Derbes price. Effect of brand cannibalism was probably there, but very weak, as the share of Derbes decreased by far less than Irbis won. One could expect Irbis buyer would intersect Tuborg beer lovers due to youth focusing (“thrill of mountain cool”) and historical green color of the brands. However, one of the two brands started to be dispensed in transparent bottle and its form and most importantly, beer Irbis image were probably special. Growing national consciousness and symbolic for Kazakhstan image of snow leopard obviously served as a good base for the brand positioning. At least, the launch itself had no influence on the market share of Tuborg. Being a permanent rival of Efes in the regional markets, Carlsberg mainly took sales from it. But since Carlsberg does not dominate so obviously and it is not the only active market player in Kazakhstan, company’s attack can not be explained as competition #1 and #2. To our mind South Kazakhstan region became the major growth point for Carlsberg. Here a serious market format change took place as Carlsberg substantially ousted the regional leader, company Shymkentpivo. And again there were accuses of too open attack on the popular brand. The draft version of Shymkentpivo is well known to all beer lovers in Kazakhstan and provides the bulk of sales to the company. However, late in 2015, brand name usurpation was reported during a press conference. 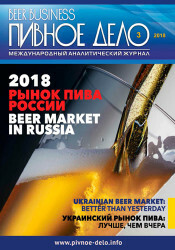 “At several HoReCa establishments of Almaty and Shymkent, clients, on ordering beer Shymkentskoe, and expecting to get a product of our brewery, got an absolutely different product, - Vidadi Gadzhiev, marketing and sales general manager deputy of Shymkentpivo complained, - As they felt the difference, clients started complaining that Shymkentpivo considerably changed the taste. And these claims are directed to Shymkent producer. Yet it is found out that under brand name Shymkentpivo in that case beer Derbes Shymkent mild was sold. And that beer was produced by Carlsberg at the end of the previous year and has no relation to the original product”. It is unlikely that output of Derbes Shymkent Mild was the main driver of Carlsberg market share growth in South Kazakhstan region as according to market players, in that region the company was actively developing the brands that yielded success at the national level. However the keg market in south of the country is well developed and attractive. Carlsberg, as we can see, was active in all market segments and Kazakhstan regions. According market players’ data, though Shymkent market showed the highest performance in 2015, there were a lot of growing points. This is the biggest market of Almaty, where despite the fierce competition, the company had good results (in the first place due to Zatecky Gus). And the bulk of net contribution was made by many regions, where the company invaded Efes territory. 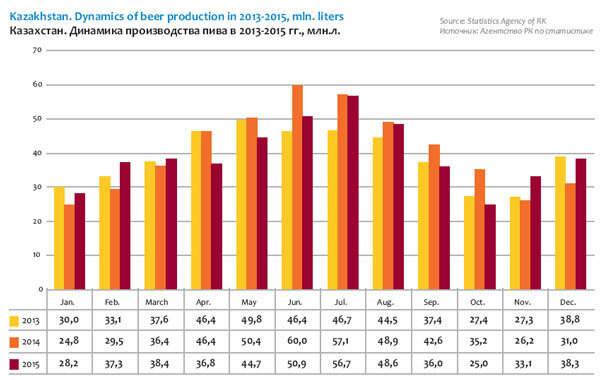 Under our rough estimation, the output of Perviy Pivzavod in 2015 increased by nearly …% up … mln dal of beer. Despite the modest against the nation volume, restart of Perviy Pivzavod under the auspices of Oasis CIS means complication of the market structure and strong intensification of the competition. This international company knows how to gradually take market share from transnational groups by means of attractive portfolio and developed marketing. By the end of 2015, the company share reached …%, which looked not bad, given the capacity was put into action in 2013. 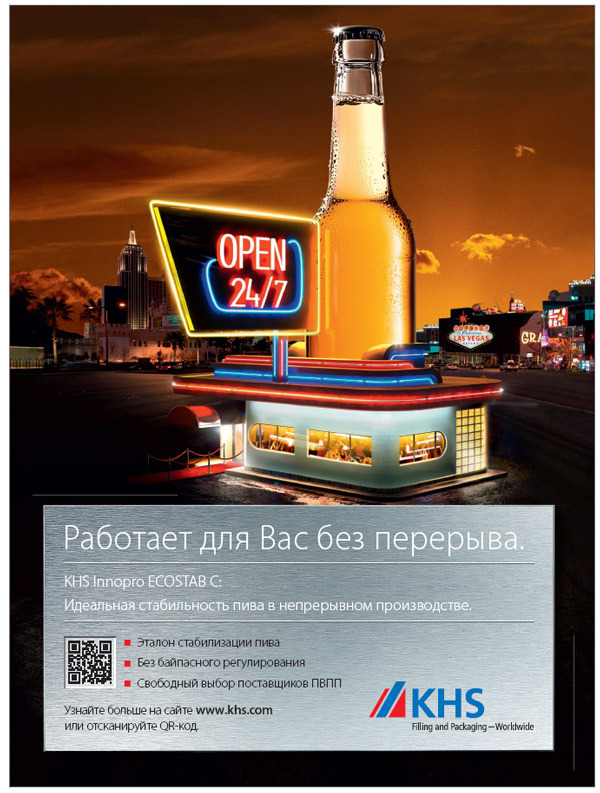 Oasis CIS entered Kazakhstan as early as in 2010, starting the market developing by import beer supplies. It is known that, when launching production, the company always formed a portfolio of brands having a background, a real story, and a positive image among local consumers. That is why it is no wonder that the new project appeared not on the scratch, as the business became the successor of Perviy Pivzavod, closed in 2007 because of urban redevelopment of Almaty. In issue 4-2015 of Pivnoe Delo there was a detailed interview with Vladimir Aidarbekov, CEO of Perviy Pivzavod. That is how he commented on the company strategy: “while our competitors are updating images of old brands, we, being a young ambitious team, are bringing out new sorts and brands. And in this sense we can rightfully say that it is we who set beer trends and advance innovations. We aim to become something like a “beer boutique” for our consumers”. To our opinion, the phrase “beer boutique” serves well to describe the brands portfolio with big proportion of premium brands. Until recently, the company was growing due to famous Russian and world brands. The bulk of sales in our opinion accrues to brand Zhiguli Barnoe, and superpremium Heineken has a big weight. We cannot but tell about the original marketing vehicle, the launch of premium Kazakh brand “1858”. At the same time, the economic slowdown has somewhat dampened consumers’ interest to expensive beer and made the company shift the focus to economy brands. That is why in 2015 the market share was taking place due to the economy brand Zolotaya Kruzhka and strong medium priced beer Teterev. The brand structure in general became more balanced. The potential for Perviy Pivzavod development to a large extent lies in regional expansion. Owing to comparatively small starting output volumes, focus on the premium segment and production location, the company is well represented on the market of Almaty city, where it currently controls about …% of the market. However, the distribution level and the market share is much lower in distant regions, especially on the north of the country. Independent regional producers by the end of 2015 produced nearly … mln dal of beer in aggregate, that is, the production stayed comparatively at the level of 2014 with only a …% growth. This allowed increasing the share in the national output volume from … to …% under our estimation. However, the dynamics of different brewing companies was uneven. 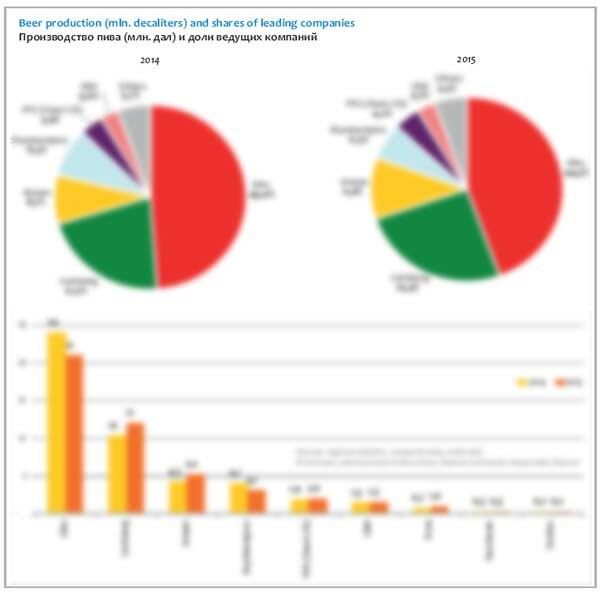 While Shymkentpivo has cut the production considerably, the majority of others on the contrary increased it. On the one hand, the regional companies benefited from low prices that drew economy consumers, on the other hand, steady interest to draft beer made its contribution. Under our assessment, Firma Arasan in 2015 increased production by approx. …% to … mln dal. Basing on the regional statistics data, high production dynamics of the main subsidiary in town Rudniy stayed relatively at the level with the previous year or was even a little higher. Such brilliant performance allowed Firma Arasan to reinforce its third position `among Kazakhstan beer producers, which was taken in 2014. According to the company statement, currently the capacity of brewery is … mln dal yearly, but taking into account the seasonality and present output volumes, the potential can be even higher. 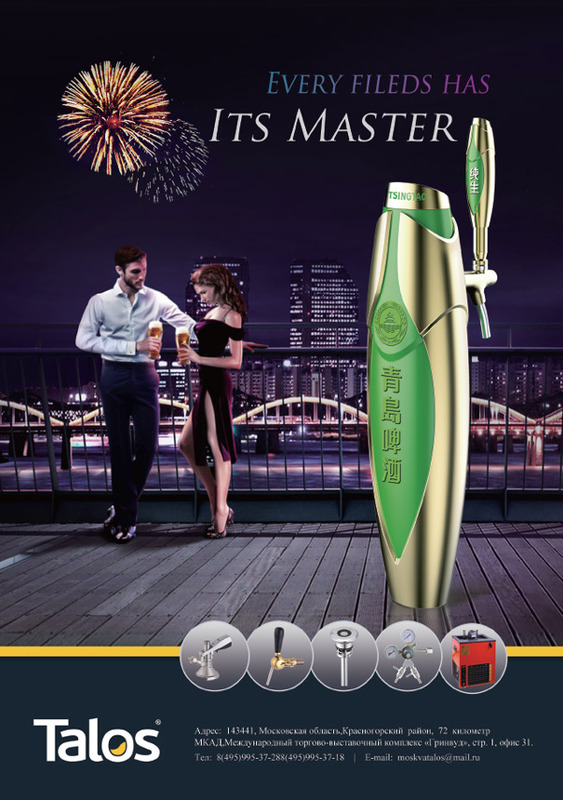 The high growth rates of the company were under our estimation in the first place connected to the sales increase of draft beer on the local market as well as to export direction development and gradual strengthening of Arasan positions on the packed beer market. The company’s sales of keg beer rely on the developed marketing network. Under the assessment of the National Chamber of Entrepreneurs “Atameken” in 2014 the company’s production was sold at 3500 thousand outlets of retail dispensing beer from kegs. As Shymkent’s sales were falling, the company was gaining ever larger share of the draft beer market and in 2014 it became the leader in that segment. Arasan’s market share is the biggest in the domestic and north regions of Kazakhstan and the development is taking place by south expansion. In 2009, the company started developing import actively. Firma Arasan entered Russian market through Chelyabinsk. Such direction was prompted by logistics. For example, Astana, the nearest big city of Kazakhstan is located twice farther and its beer market share is a fraction of Chelyabinsk. The network of specialized beer retail of the Ural region holds out for objects number in Kazakhstan, basing on 2CIS data. In numbers the export supplies are difficult to measure, it is known that the volumes of draft and packed beer are rather big as for a regional brewery. Given the transparent border between the countries and complex structure of trade relations, the official statistics virtually does not register beer export. It is unlikely that Russia was the main outlet market for the company, but its share can reach …% or even more. 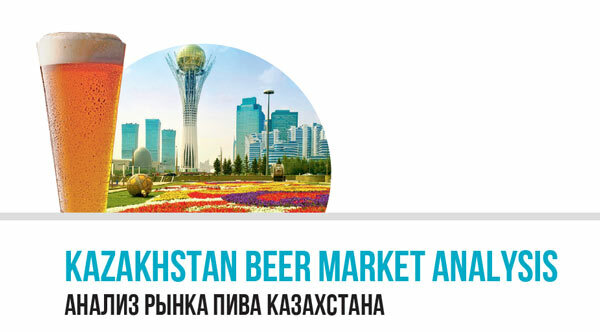 The packed beer market of Kazakhstan under our estimation is so far of little importance for the company sales. In this huge segment Arasan share currently constitutes about …%, but it is growing rapidly, so in the course of time, the direction of food retail can be the leading one from the potential growth point of view. About ten brands by Arasan are positioned in the economy segment and their retail price is one of the lowest in Kazakhstan. According to market players, more than a … of food retail accrues to beer Zhigulevskoe. Beer Erzmann, that was launched on the market about 10 years ago, is also rather prominent. At that time the company was planning to win a substantial share of packed beer market and got into marketing. But they were probably hampered by production limitations and strong competition. Today, the company’s share growth is dependent on distribution extension to distant regions of Kazakhstan, where the firm is so far poorly represented in the segment of packed beer. Shymkentpivo faced a lot of difficulties in 2015. Judging by the data of the regional statistics, the downswing at the brewery got worse, as over the year it has fallen by a …r to .. mln dal. As we have mentioned, the downswing partially resulted from Carlsberg, Perviy Pivzavod and other producers’ expansion to the market of packed and draft beer in the south of Kazakhstan. The business’s current problems are caused not only by competitors but by two other aspects. One of them is arrears on the loan to $... mln that was taken in 2007. The other one is legal prosecution against the company management, started because of ambiguous reasons. However Shymkentpivo still holds good positions on the draft beer market in the south of the country. And brand Shymkentskoe is one of the best loved among the Kazakhstanis. Most probably the company will overcome the challenges and resume the operation. Company Caspian Beverage Holding (CBH) in 2015 managed to enlarge its market share, which, by the year end, was a little more than …%. The positive dynamics was coupled with the positions reinforcement on Almaty market, where CBH share reached nearly …%. Almost the whole sales volume presently accrues to beer Zhigulevskoe. As we have noted above, the company had to leave the region because of Russian expansion and logistics costs. However, it was probably a temporal retrieve. Besides, CBH used to seriously consider supplying beer to the Ural region of Russia and China. To get the full version of this article propose you to buy it ($30) or visit the subscription page. The article materials were prepared using data by “Republic Kazakhstan Agency on statistics” (“Kazstat”). A number of estimations are based on information provided by beer producers and by research companies. 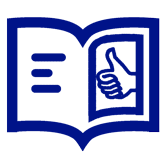 The publication in issues “Kursiv” and “Forbes Kazakhstan” were used in the article preparation. In case the information source is not provided, the data on companies’ output and their interpretation are our assessment based on the current trends. We do not guarantee that the given information is absolutely correct, though it is based on data obtained from reliable sources. The article content should not be fully relied on to the prejudice on your own analysis.